This post is written by contributing author Rebecca D. Dillon. I've really tried to make improvements in my diet over the past year. By cutting way down on carbs like pasta and breads - which I rarely eat now - as well as white potatoes, I was able to go down two pant sizes. In doing this, I also started taking a look at new foods I hadn't tried before. One of my favorite new foods I discovered during this process was flax seed. Not only does flax seed taste surprisingly good, but it's also believed to help reduce your risk of heart disease, stroke, diabetes, inflammation, lung disease, breast, colon and prostate cancer - even hot flashes in menopausal women. 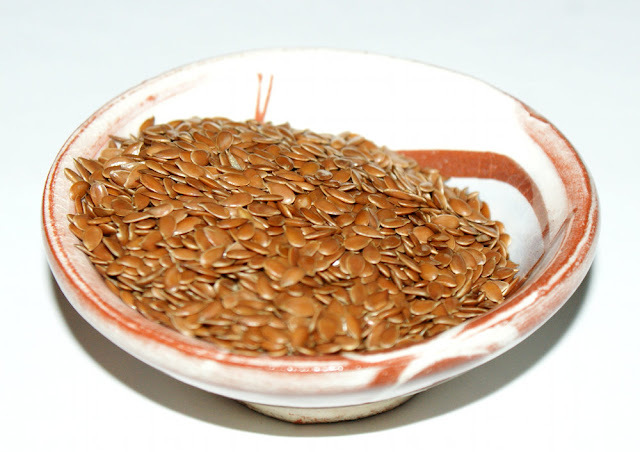 The cultivation of flax seed goes as far back as 3000 BC Babylon where the King Charlamagne actually required his subjects to eat flaxseed as part of their diet. Flax is rich in Omega-3 fatty acids, Lignans, and Fiber. It's now widely available in most local grocery stores as well as online and is available whole, ground, and even as an oil. The shell of whole flax seed retains and protects the fatty acids that make flax seed so nutritious, while ground flax seed and flax seed oil will start to lose these fatty acids over time. Therefore, I recommend buying flax seed whole as you will get the most benefit from grinding whole flax seed in a coffee grinder just before use. Plus, whole flax seed can be stored up to a year in a cool, dark place. Alternately, you can grind up flax seed ahead of time and store in the freezer to keep the flax from oxidizing and losing its nutritional potency. It's recommend you eat between 1-2 Tablespoons of flax a day. This is a lot easier to do than you may think. I love flax seed in my granola cereal. It's also really good in yogurt and oatmeal. Additionally you can also swap part of the flour in your recipes for things like pancakes, muffins and breads. If your recipe calls for 2 cups of flour, simply substitute a 1/4 cup of freshly ground flax seed for 1/4 cup of the flour. You can also hide flax seed inside of dark sauces, casseroles and meat mixtures. Have you tried flax seed yet? Rebecca D. Dillon claims a fine arts degree from Roanoke College and has enjoyed being creative since she was a small child. She resides in the Historic Arts District of her hometown where she lives with her miniature dachshund, Jasper, and works for a small business full time. Part time Rebecca handcrafts and sells homemade soaps, lotions and lip balms for her home business, Rebecca's Soap Delicatessen. In her spare time she squeezes in time for dancing, live music and the occasional karaoke. She is also the author behind Soap Deli News blog where she shares her DIY projects, bath and beauty recipes, handmade finds and other things that suit her fancy. Connect with Rebecca on Twitter and Facebook. I haven't tried grinding flax seed yet but have been meaning to try it! Oh, you can try incorporating ground flax seed in muffins or bread, delicious and healthy! My favorite breakfast has chia seeds and flax meal in it! Recipe Below! I love flax seeds. I have usually bought it ground, but buying it whole sounds like a better option. Thanks for sharing.